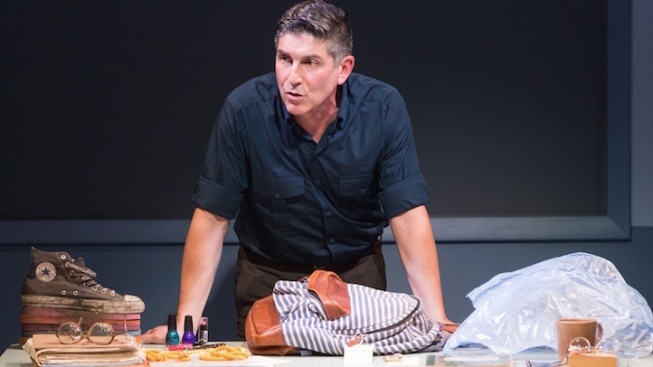 James Lecesne in "The Absolute Brightness of Leonard Pelkey." That’s the question asked in “The Absolute Brightness of Leonard Pelkey,” the remarkable and heartwarming one-man show playing through Oct. 4 at the Westside Theatre that will leave you wiping away tears at your seat. Written and performed by James Lecesne, and based on his 2008 book of the same name, “Absolute Brightness” tells the story of detective Chuck DeSantis, a small New Jersey town investigator who sets out to solve the disappearance of a flamboyant 14-year-old boy named Leonard Pelkey. Through Leonard's world, DeSantis confronts the horrors of bullying and sees how a community can learn to embrace their differences by having the courage to stay true to their individuality. It is by no means a new message to be receiving, especially in our culture of increased visibility and acceptance of the LGBTQ community (see: the “It Gets Better” campaign, Caitlyn Jenner, the SCOTUS’ decision to legalize gay marriage nationwide, etc). On paper (or in this case, on the web), it’ll sound like “Absolute Brightness” is preaching to the choir. Still, that doesn’t make the themes in “Absolute Brightness” any less important. Suicide is statistically the second-leading cause of death among people ages 10 to 24, and each episode of LGBTQ victimization, such as bullying or physical abuse, increases the likelihood of self-harming by 2.5 times on average. And according to the National Coalition of Anti-Violence Programs (NCAVP), 2014 saw 1,359 incidents of anti-LGBTQ violence -- an 11 percent increase in homicides from the year before. Lecesne himself has been a long-standing advocate for the gay community, having won an Oscar for writing the 1994 short film “Trevor.” He was inspired by that project to start the Trevor Project, the only nationwide 24-hour crisis intervention and suicide prevention lifeline for LGBTQ youth. “Absolute Brightness” humanizes those statistics through Leonard’s story -- though we never get to meet the boy in question. Instead, Lecesne introduces us to nine characters who orbit Leonard’s world. There’s Ellen, the sultry owner of a local hair salon who takes Leonard under her wing. 16-year-old Pheobe, Ellen’s nerdy, shy daughter. Even Otto, an old German clock repair shop worker who came to understand his own gay son through talking with Leonard. Lecesne plays them all, effortlessly transitioning between each character with only a moment’s notice. No props or costume changes are used either -- Lecesne simply shifts his voice and changes his mannerisms, unraveling each new character before your eyes. It’s a marvelous performance from a poignant storyteller, and the familiarity of the characters he creates will help you relate to the story even more. Lecesne is good as all his characters, but none quite bring the laughs and tug at your heartstrings more than Marion, a no-nonsense smoker who meets Leonard while shopping the aisles of CVS. Through a drag of a cigarette, Marion explains how Leonard’s friendship helped her embrace her true self. Featuring a tender score by “Spring Awakening” and “American Psycho” songwriter Duncan Sheik, “Absolute Brightness” is a must-see story of love and faith that will challenge you to embrace those around you for their differences. Go see it -- and bring a box of tissues. “Absolute Brightness,” through Oct. 4 at the Westside Theatre, 407 West 43rd Street. Tickets: $85. Call 212-239-6200.